Some colleges have admissions videos with students talking about academics and extra-curricular activities. Elon University’s video features students talking about building deep friendships, discovering their passions, and growing personally during their time here. Elon is looking for “smart students with a good heart.” The latter part refers to students who are involved in activities at a leadership level – and they expect students to continue to do more than just academics in college. The Elon Experience, as they refer to it, requires students to do two of the following before they graduate, in addition to their curricular work: internship, study abroad, community service, organizational leadership and undergraduate research. I was especially intrigued by Elon’s programmed gap semester program, in which accepted students spend several weeks at Elon’s facility in Wyoming working on team building and leadership skills, then spend one week each at four locations across the United States, then travel to Costa Rica for a four-week study abroad experience. This could be great for the right student. 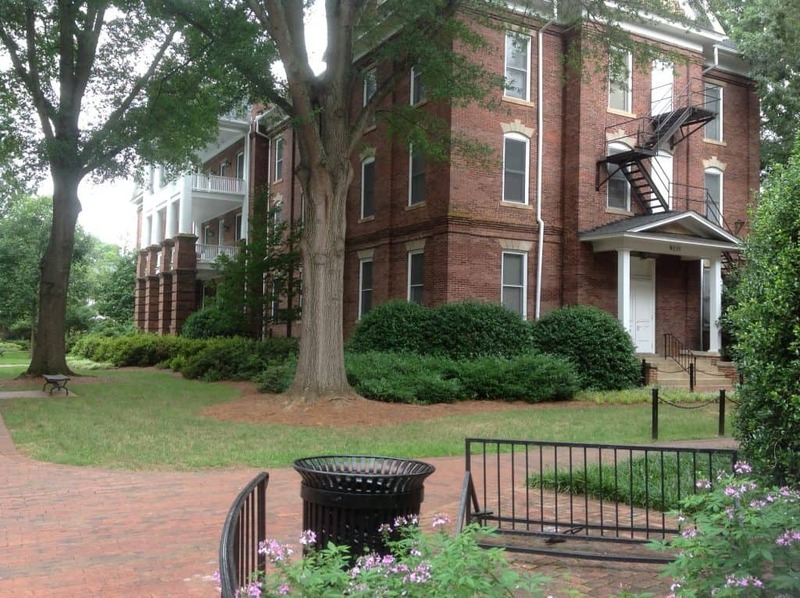 One of the few buildings at Elon that survived the fire in 1923. Founded in 1889, Elon’s entire campus burned down in 1923. The campus has been rebuilt and extensively grown and renovated since 1999, under the leadership of President Leo Lambert. Lambert’s vision has brought Elon to national stature, now with complete colleges of education, business, communications and arts & sciences. While Elon does not have an engineering school, students can study math and physics for three years and then transfer to a number of well-respected universities (including Washington University in St. Louis and Columbia, among others) and receive 2 bachelor’s degrees. There are 5,300 undergraduate students at Elon, and 14 colleges within an hour radius. While the town of Elon is not quite a college town, the area is filled with a variety of colleges and thousands of students. Elon is not affiliated with any religious group. The average class size is 21 and classes are capped at 33 – even introductory courses. Elon is a place where students will have direct contact with professors from freshman year forward. My tour guide Elizabeth was an art history and business marketing major from Richmond. The business program is very strong, with about 20% of the students majoring in this area. The exercise science program is strong, and NBC News anchor Brian Williams serves on the Board of Advisors for the School of Communications (his daughter attends Elon). The school’s students have won national awards for television and film, as well as multimedia productions. Elon’s beautiful campus is growing, with new dormitories and an international food hall under construction. You can see all of my photos from my trip to Elon here.